Relieve piriformis muscle pain, stretch tight hip flexors, correct rotated pelvis, uneven hips or rotated pelvis, improve body alignment with Pelvic Clock® exercise program. Piriformis Syndrome is a painful, chronic condition that can last months or even years. The stretching of your piriformis muscles helps temporarily, but the pain just keeps coming back. Sound familiar? The reason is often related to pelvic misalignment. 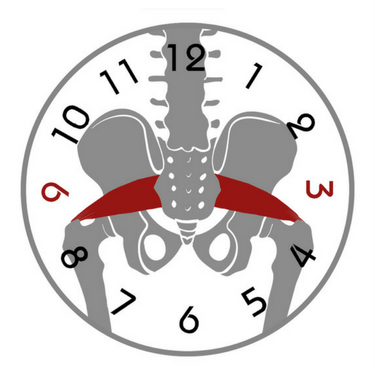 Since the piriformis muscle is attached to the hip bones, having tightness can lead to uneven hips, anterior (forward) pelvic tilt, or even having a rotated pelvis. Any of these conditions can cause piriformis muscle spasms.